Jackie Tyrrell watching on at Croke Park on Sunday. HE COULD TAKE his tally of All-Ireland medals into double figures but Jackie Tyrrell isn’t sure if he’ll be back in the black-and-amber jersey next year. Having missed Kilkenny’s semi-final win against Waterford due to a stress fracture in his foot, Tyrrell had to settle for being an unused substitute for the duration of Sunday’s All-Ireland final defeat of Galway. The James Stephens clubman watched on from the bench as the Cats defeated the Tribesmen by 1-22 to 1-18 at Croke Park, which gave him his ninth senior All-Ireland medal. 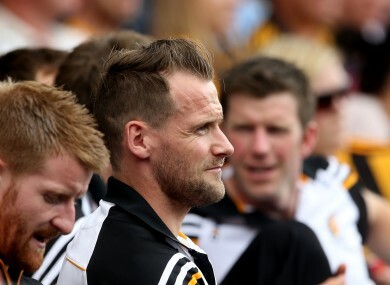 Although Tyrrell wasn’t called upon to enter the fray on Sunday, the 33-year-old defender did make an important contribution by giving a rousing half-time speech when Kilkenny trailed by 0-14 to 1-8. “There’s been a bit made of it,” he said. “Some of it has been over-hyped. I spoke from the heart, tried to motivate the boys and show the opportunity that they had in front of them. “I was [concerned], absolutely. I knew they had the squeeze on us and should have been more up. That was what I stressed to the lads, what an opportunity we had. Tyrrell added: ”If something has to be said, you say it. Either you’re going well or you’re not going well. If it needs to be said, contribute, and that’s the ethos there. “I’d say I never have [been as vocal in the dressing room]. I didn’t go in to say: ‘Right, I’m going to let these lads have it’. I just went in and there was a deadness about it, there was a casualness about it. Tyrrell said he would have been capable of playing on Sunday, had he been required, but his foot injury isn’t a thing of the past just yet, with his metatarsal currently being held in place by a screw. The injury will be a factor when Tyrrell sits down to consider his future as an inter-county hurler. He was adamant that he’d be back when asked the same question after the win against Tipperary in last year’s final, but is Tyrrell prepared to return for another season — his 14th — at the highest level? “I wouldn’t say I’d be as adamant here now. I’ll have to weigh up everything. Obviously the foot comes into consideration, I have to go back to the surgeon. I know I am not finished with him yet. Elaborating on his views regarding modern hurling, Tyrrell added: “Maybe pace isn’t the right word; non-stop intensity. I don’t think it was any faster than the previous All-Irelands but the rate of turnover of the ball is just phenomenal. There’s plenty for Tyrrell to take into account before making his decision, but the tempting prospect of winning a 10th All-Ireland medal will surely be difficult to ignore. Email “Jackie Tyrrell is uncertain about returning to challenge for a 10th All-Ireland medal in 2016”. Feedback on “Jackie Tyrrell is uncertain about returning to challenge for a 10th All-Ireland medal in 2016”.